Are these lectures available for download free of charge? Or is that (along with USB stick construction) what the $$ is for? 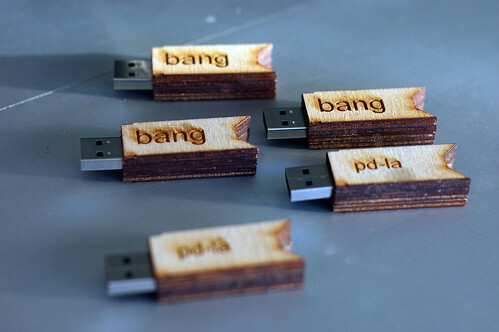 The money is mostly to cover costs – it’s a 16 GB stick (they’re not cheap yet), with some plywood, glue, and laser time – plus a little to raise money to support the patching circle and pd-LAunch. The videos will all be available free for download from UCSD. It may take a little bit to get them up there, but we will announce it here when they are ready. Any updates on when/where these lectures will be online Theron? I’m getting ready to send out a batch of these. I handle them personally because we’re still not set up to ship at CRASHspace. If you want one, e-mail me at theron.trowbridge@gmail.com and we’ll figure out how to get you one. I want one, please! Could you send it to my mail address? I’m interested in accessing the lectures, and possibly purchasing the USB. However, I’m in the UK. E-mail me at theron.trowbridge@gmail.com and we’ll discuss options and figure out shipping costs. I can send out DVDs pretty inexpensively. Shipping internationally on the sticks gets expensive because it won’t fit in a letter envelope and I have to ship out air mail or Priority.